A small parade of witnesses will take the stand Wednesday during the House Oversight and Government Reform Committee's hearing on the Toyota (TM) recalls, but the real focus of the day will be on one man: CEO Akio Toyoda (pictured). How he comes across in these hearings will be critical to the repair job the once-vaunted carmaker's now-sullied image badly needs.Toyota has tried to get out out in front of the congressional investigation. Its repairs of 2.4 million of eight of it most popular models with accelerator problems are already under way. Toyota U.S. Chief Operating Officer Jim Lentz has said that the issues that caused many of the recalls will be solved immediately, and he has apologized for the company's slow reaction. He toldReuters, "We now understand that we must think differently when investigating complaints, and communicate faster, better and more effectively with our customers and our regulators." Lentz, too, will appear before the House committee. Members of Congress will have four questions about the Toyota recalls. First: Why didn't Toyota's quality-control measures prevent the problems that now affect millions of cars? Second: How quickly will the automaker be able to bring in and fix those cars? Third: Why was Toyota so slow to make the decisions to recall them? Those three are important questions, but it's the fourth and final issue that will most interest lawmakers: Did Toyota cover up any early knowledge about the defects, or put its finger on the scales of research meant to find problems with its vehicles? Congressional testimony always comes in two parts. The first consists of statements by the witnesses. 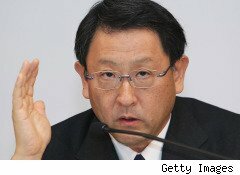 Those made by Toyota managers will emphasize the company's plans to change its approach to quality assurance. Their statements will be predictably filled with apologies and comments that the problems that led to these recalls go against everything in Toyota's long record of quality and customer satisfaction. Most important, Toyota's management will deny any early knowledge of the defects that caused the recalls, or any attempts to hide the facts. The second stage of the testimonies by Toyota management will be much more critical. Congressmen will take their turns aggressively questioning those witnesses about how the automaker could have overlooked so many defects on so many vehicles. Legislators will no doubt express a great deal of skepticism about the amount of time it took the company to begin the recalls, and they'll press the question of whether Toyota tried to dodge responsibility for the defects. There are allegations that it bragged in an internal memo about saving $100 million by negotiating with federal authorities in 2007 to cut the number of cars affected by a previous recall to fix unintended acceleration problems. That memo also allegedly states that the company successfully convinced the National Highway Traffic Safety Administration that the source of those problems could be entirely traced to faulty floor mats, not to mechanical issues involving the accelerators themselves. Finally, the most difficult questions will follow the lead that a grand jury has already taken. Toyota received subpoenas yesterday as the feds launched a criminal investigation into the safety problems. The perceived results of these hearings will depend far more on what occurs during the Q&A periods than on what's said during the prepared testimony -- and that will be doubly true when CEO Toyoda testifies. His ability to answer questions accurately, at least to the satisfaction of the congressmen, will be crucial. But more important will be the impression he leaves about his credibility. A great deal rides on Toyoda's ability to convince the House panel -- and the American public -- that they can begin to trust his company again.